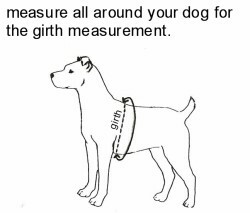 How to measure your dog for the best possible fit! The best way to choose the correct size range is to measure your pet. A dressmaker’s tape measure is the most accurate, or a shoelace or piece of string can be used and then measured against a ruler, or even estimated against a known length, like a standard sheet of copy paper (8.5" x 11", for US letter-size.) Measure snug against the fur, and for harnesses, measure while your pet is standing. Measure chest girth . In all cases, the extra room needed for a comfortable fit can be estimated by taking the actual-inches-around and adding about 5% of that amount to the total. This is more accurate than ‘measure and add 2 inches’. 2 inches is a lot to a Chihuahua, but may not be enough for a Mastiff.